Two centuries ago, in 1815, Napoleon had made a meteoric return to power, only to be defeated in battle at Waterloo in June. He abdicated later that month. In the same month as the Battle of Waterloo, the Royal Academy Summer Exhibition opened in London. It featured two major new paintings by the highly acclaimed and popular artist, Joseph Mallord William Turner (1775-1851): Dido Building Carthage, or, The Rise of the Carthaginian Empire (1815), and Crossing the Brook (1815). The first of these, Turner considered to be one of his major works. Painted after Claude Lorraine, it had one notable critic, the connoisseur and collector Sir George Beaumont, who complained that it was “painted in false taste, not true to nature”. 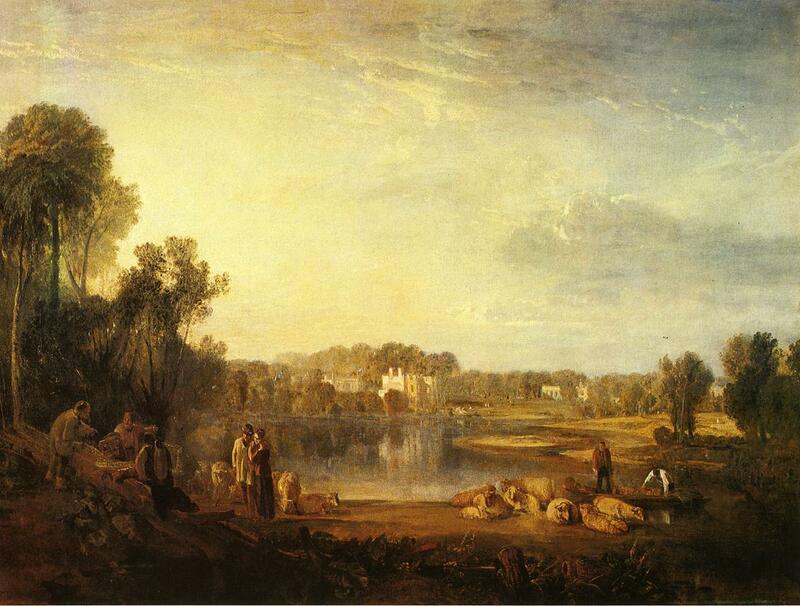 At the time, Turner was almost unrivalled: the brilliant Thomas Girtin had died tragically of asthma in 1802, and John Constable was still struggling to achieve recognition, being unable to sell his first painting until the following year, when he also painted the successful Wivenhoe Park (1816). Turner became used to Beaumont’s complaints, and knew that he was providing Constable with support and encouragement. Turner was the son of a London barber and wig-maker, whose mother had been committed to a hospital for lunatics in 1799. An early prodigy, his sketches were first shown in his father’s shop. He entered the schools of the Royal Academy of Art at the age of 14, in 1789, and exhibited his first oil painting in 1796. A fuller biography is given in this article in the Favourite Paintings series. He started travelling through the UK to paint watercolour sketches of its castles, towns, and rivers, and first visited France and Switzerland in 1802. In the summer of 1811, he had toured the west of England, where he made studies of the River Tamar, which marks the boundary between Devon and Cornwall. 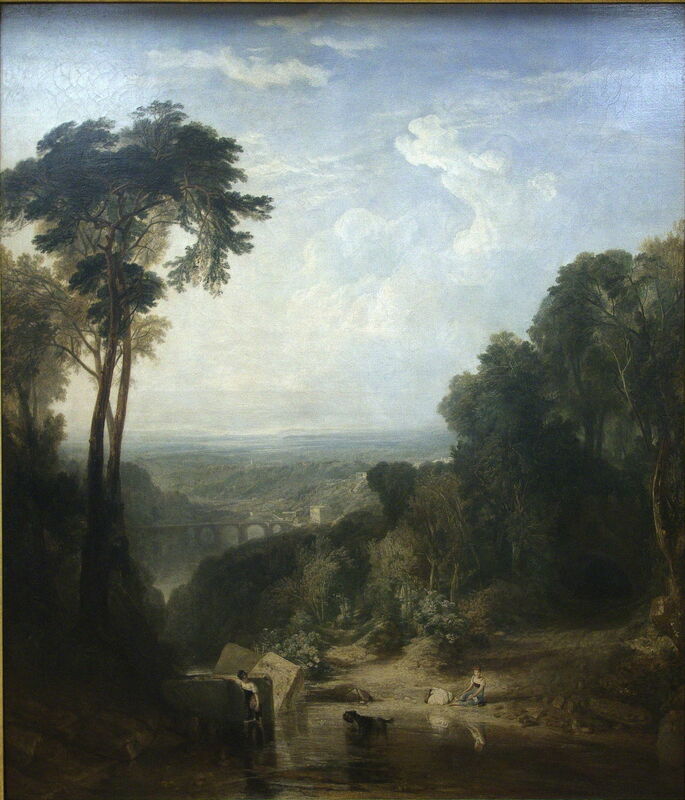 The second major painting which he exhibited in the summer of 1815 had been developed from one of those plein air studies of the River Tamar: Crossing the Brook (1815). It too was inspired by Claude Lorraine, but is more conventional, revealing its influence from the landscape tradition, including the British line which traced back to Richard Wilson (1714-1782). In the light of Turner’s later and more overtly experimental paintings, Crossing the Brook may today seem tame and conservative. 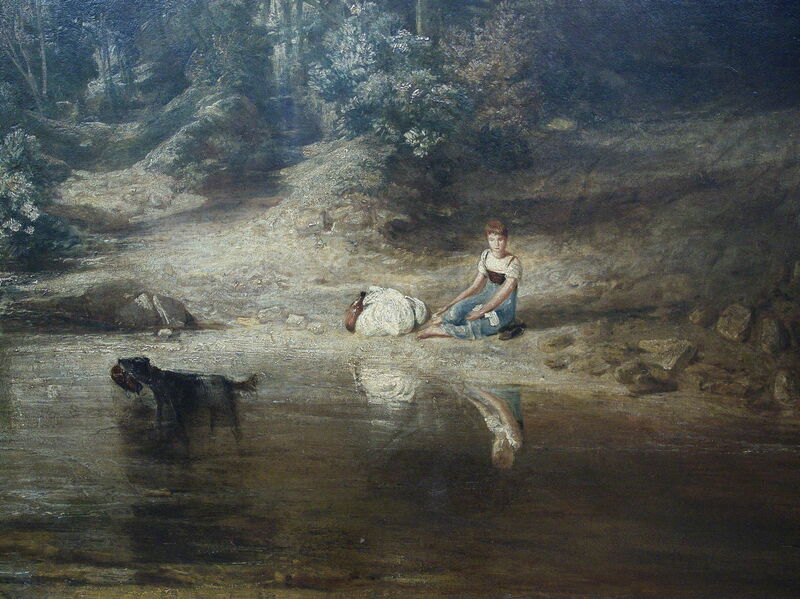 It shows two women at a ford across the brook, one (left of centre) wading in the river by some massive stone blocks, and apparently in company with a black dog, seen with a large fish in its mouth. The other sits on the far bank, beside a large bundle wrapped in white cloth, her shoes removed. 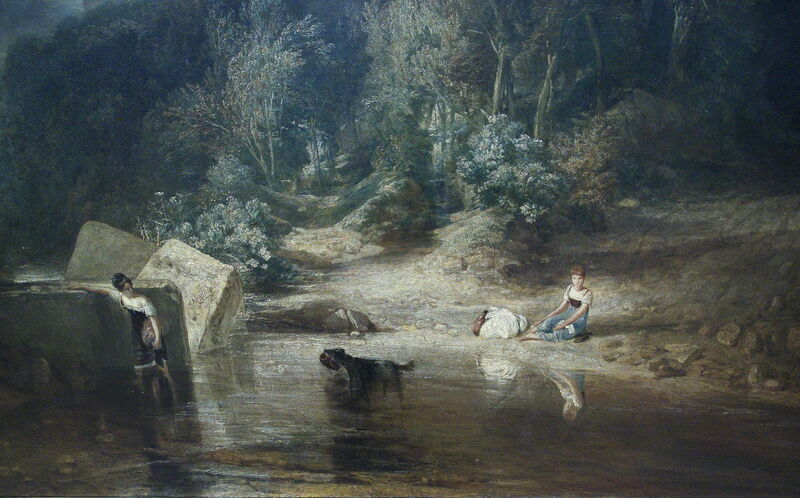 The ford is in an opening within a large wooded area, with tall trees providing repoussoir at both sides of the painting. This drops away to a long bridge with multiple arches in the middle distance, and the river (as it is by then) meanders through rolling and wooded countryside until it reaches the sea at Plymouth, in the far distance. 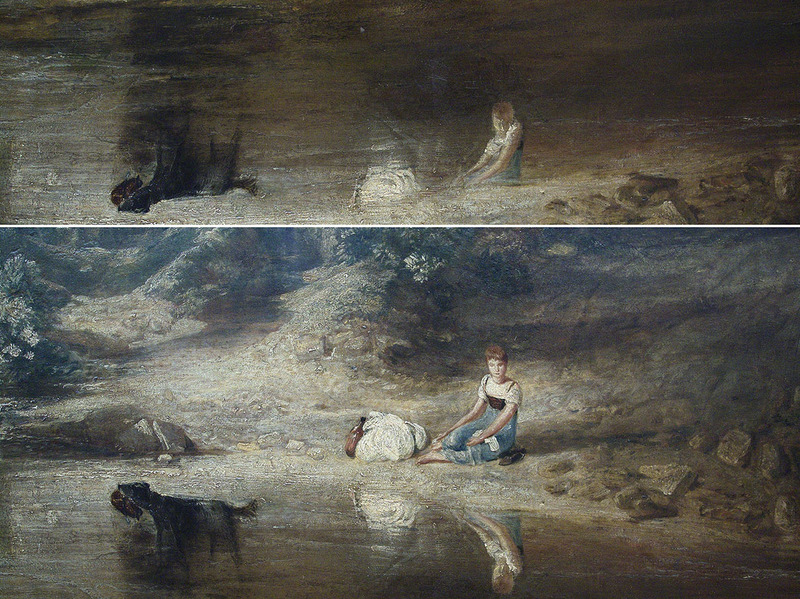 But for me, the most remarkable feature of this painting, which I find fascinating, is Turner’s depiction of the reflections in the water: because there are marked discrepancies between the unreflected image of the woman sat on the bank, and her reflection. Ever since the earliest paintings of the Northern Renaissance, with their almost obsessively detailed depiction of textures and the effects of light, reflections on water have been an opportunity for the landscape painter to show off their skills. Look in the landscape behind Jan van Eyck‘s The Madonna of Chancellor Rolin (c 1435) and you will see one of the earliest examples of the meticulously accurate depiction of reflections on water. In the three centuries which had passed since then, many Masters had demonstrated their insights into scientific optics by tackling such reflections – these include Lucas Cranach the Elder, Piero della Francesca, Raphael, Tintoretto, Titian, Caravaggio, Poussin, Rubens, Rembrandt, Canaletto, and contemporaries of Turner such as John Sell Cotman and Thomas Girtin. The optics of reflections on water are both simple and complex. However in this context, it suffices to say that the reflection is formed of the same essential view of reflected objects as the their unreflected view. 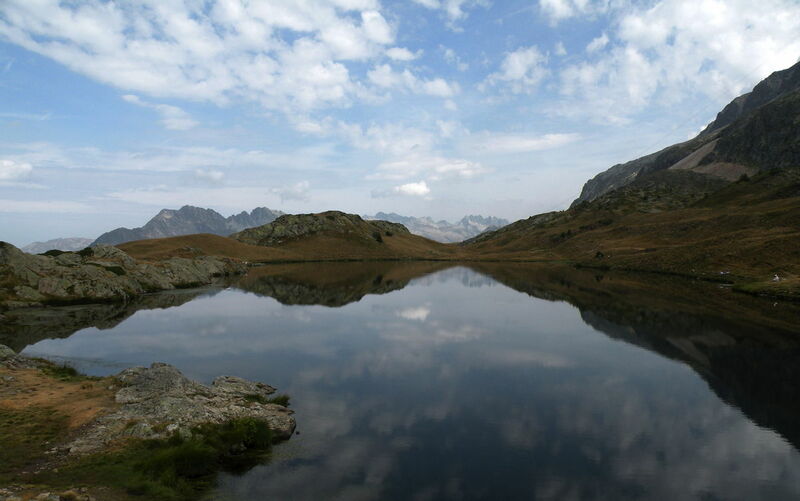 In the real world, reflections can become very complex, as the photo above demonstrates. One method which I use to check for discrepancies between the unreflected and reflected images is to un-reflect the reflected image (by reflecting it a second time), and align it above the unreflected image. It is then easy to check the alignment and representation of objects shown in the reflection. We can do this with the detail from Turner’s Crossing the Brook. Construct a composite image for analysis and I hope that you will see the discrepancies. 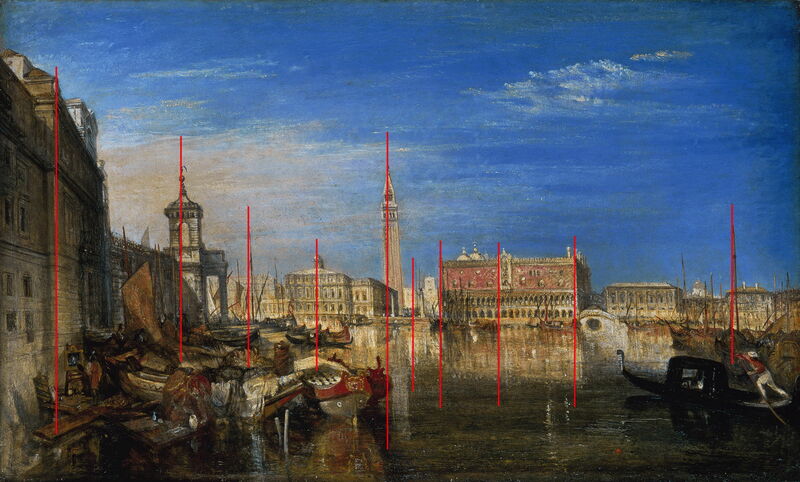 This shows how Turner reduced the natural truncation which would be expected in the reflections, as well as altering their orientation. Although the latter may have been unintentional, it appears possible that he chose to show more of the reflection for artistic effect. Similar analyses of many other depictions of reflections on water show that such discrepancies are unusual. Indeed, even in rapid plein air sketches, discrepancies in reflections are very unusual in the work of professional artists. Here, for example, is an analysis of the perspective projection in the original and reflected images of one of Sisley‘s plein air oil paintings, which would appear to have been painted without any such construction being made formally. By the time that Crossing the Brook was exhibited, Turner was a very experienced and thoroughly professional artist. He had been painting for more than 25 years, very largely landscapes, and many of those included reflections on water. If anyone of his contemporaries or his very illustrious predecessors understood the optics of reflections, it must have been Turner. This was also not a sketch en plein air, but a carefully painted studio work intended for exhibition at the Royal Academy. In many such canvases, such as Pope’s Villa, at Twickenham (1808), Turner had painted much more complex and intricate reflections in great and very accurate detail. Indeed, Dido Building Carthage, or, The Rise of the Carthaginian Empire (1815) contains quite complex reflections which he depicted accurately too. Turner’s career record of accuracy in the depiction of reflections on water is not, though, as good as most other painters of his standing. 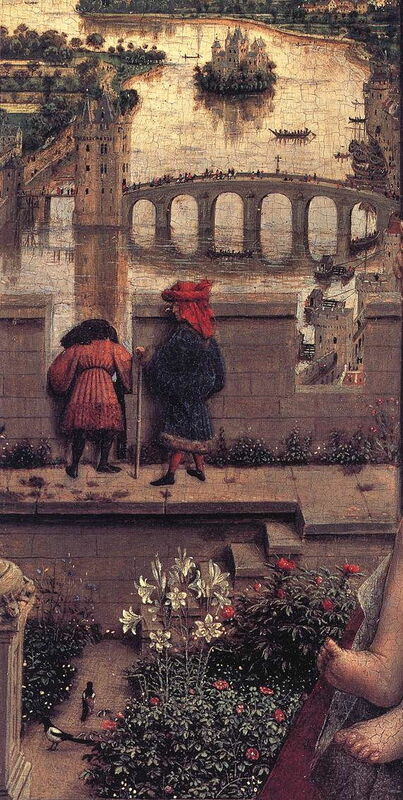 Most of his oil paintings, such as those of Venice, adhere to optical principles. Joseph Mallord William Turner, Norham Castle, on the River Tweed (1823), watercolour on paper, 15.6 x 21.6 cm, British Museum, London. WikiArt. 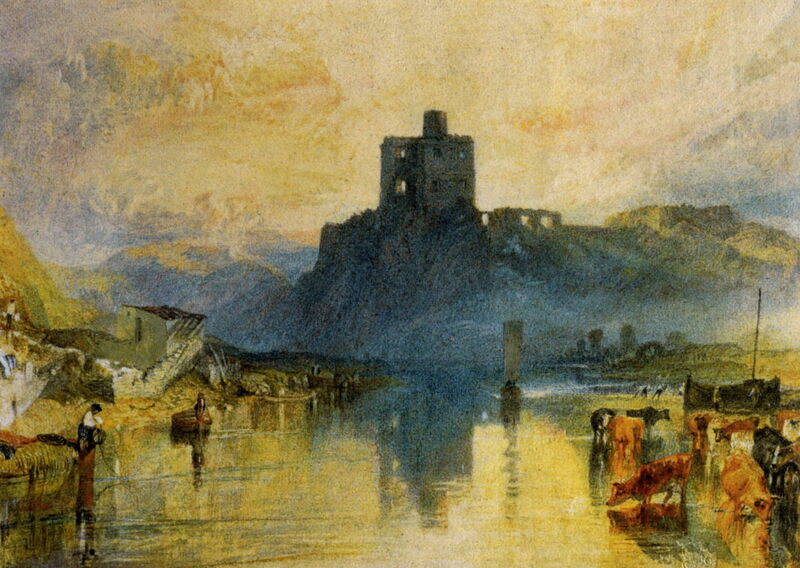 Some of his watercolours, such as Norham Castle, on the River Tweed (1823), have quirks in their reflections: in that painting, the reflection appears to show another high point at the left edge of the castle which is not matched by an equivalent high point in the unreflected castle. 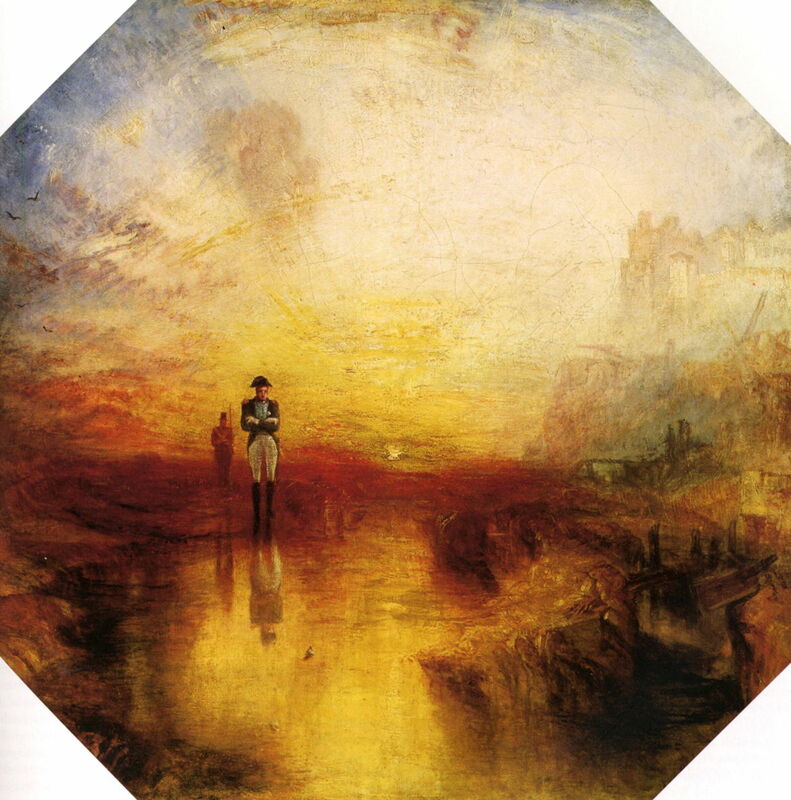 There are also occasions when Turner appears to deliberately defy optical principles. My best instance of this is in his late oil painting War. The Exile and the Rock Limpet (1842). Joseph Mallord William Turner, War. The Exile and the Rock Limpet (1842), oil on canvas, 79.4 x 79.4 cm, Tate Britain, London (N00529). WikiArt. The left, more distant, figure (of the guard to Napoleon) should not have appeared in reflection at all. However strict adherence to optics would have significantly detracted from the effect of this painting. He has also omitted shadows which might have been cast by the figures, presumably for the same reason. Given Turner’s experience and record, I do not think that these discrepancies can be accounted for as simple error. Turner was working in oils, not watercolour, and had every opportunity to correct any initial errors which might have occurred. Similarly, if he had altered the unreflected image of the seated woman, he would surely have applied similar corrections to her reflection to maintain a match. Unlike in War. The Exile and the Rock Limpet, there seems to be no compositional or artistic advantage or purpose to the discrepancies. Indeed, when I first saw this painting, it took me very little time to notice that there was a problem with that reflection: to anyone used to painting or viewing such reflections, it sticks out like a sore thumb. One clue may be obtained from a more extensive survey of the depiction of reflections on water. From the Renaissance until the twentieth century – when a very few painters started to deliberately show reflections which defy optics – there are only two artists who show discrepancies of this kind in more than a tiny fraction of their works: Turner and Paul Cézanne. There are two possibilities which spring to mind, which may link these two artists. First, they were both extremely innovative, pushing the boundaries of what was considered acceptable in landscape painting, in very visual ways. Although there are many other innovators, the nature of both Turner’s and Cézanne’s innovations were to increase the dissociation between the purely optical image of a motif, and their paintings. It may be that reflections are sufficiently complex as to be caught up, unintentionally, in that push to innovate. 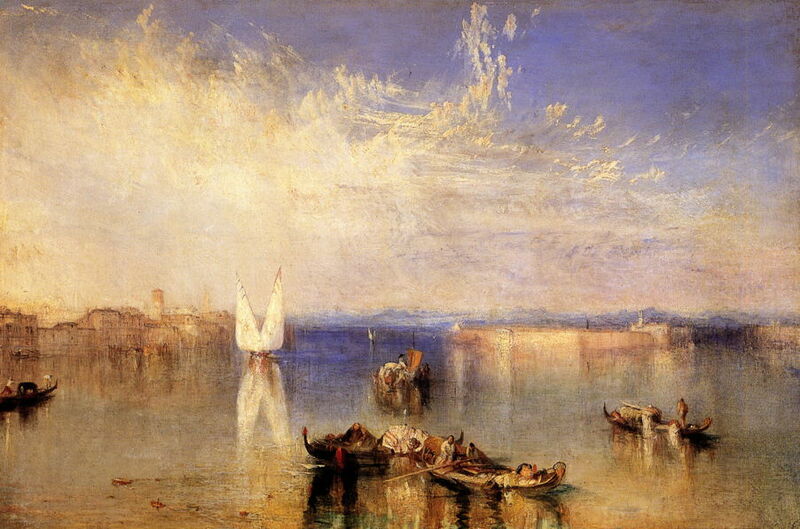 However, in Turner’s case at least, his discrepancies also occur in paintings which are not particularly innovative. The other is that both showed evidence of other dissociation between the optics of images and their paintings. I think that is generally accepted for Cézanne, and hope that I do not need to produce any further evidence. Although Turner was a prolific and highly accomplished draftsman, sketcher, and painter, some of his paintings show other optical oddities. His Bridge of Sighs, Ducal Palace and Custom-House, Venice: Canaletti Painting (1833), which was also his first oil painting of Venice, places all the buildings leaning to the left, with their reflections leaning in the opposite direction. Had this painting been on a canvas support, there might have been distortion applied by its stretching or subsequent treatment, but unusually Turner painted this on a mahogany panel. Joseph Mallord William Turner, Bridge of Sighs, Ducal Palace and Custom-House, Venice: Canaletti Painting (1833), oil on mahogany, 51.1 x 81.6 cm, Tate Britain, London (N00370). Wikimedia Commons. 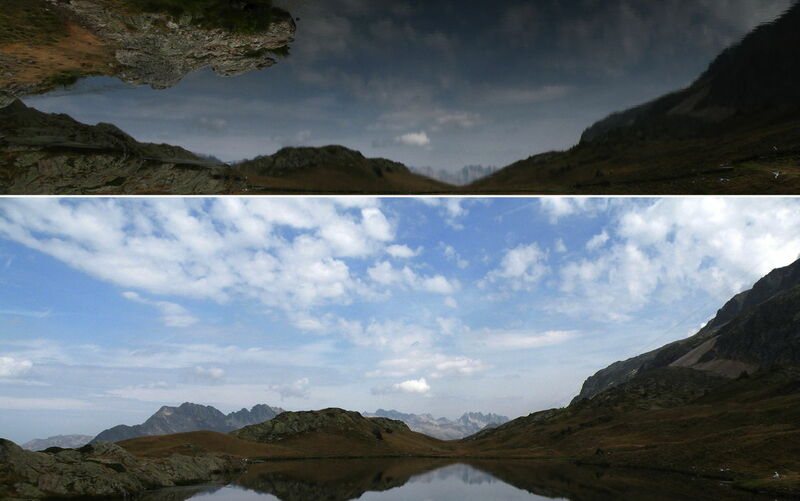 Perpendiculars have been superimposed to show failure in vertical alignment of the unreflected and reflected images. Drawing or painting reflections on water, particularly those in a purely mental image rather than a motif in front of the easel, is probably the most difficult single task in any genre of painting. There are no simple tricks which can be used to make the task easier: inverting the canvas reverses left and right (which are not reversed in reflections), making it even harder. Simple rules, such as ensuring vertical alignment of corresponding points in the real and virtual images, do not make the more difficult elements of the task any easier. This is a classical situation in which an underlying tendency to dyspraxia (as a disorder involving the motor expression of a mental image) could become unmasked: a well-practised and highly proficient draftsman could find their drawing literally going to pieces. From the early Renaissance, realist painting (and drawing) has put great effort into depicting accurately images showing reflections on water. Many if not most Masters have demonstrated their skills at this task on many occasions, and it remains a tour de force demonstration of artistic skill. Several of Turner’s paintings show discrepancies in the depiction of their reflections, which are most unlikely to be errors. In some cases they appear to be deliberate artistic choices, but in others their explanation is less clear. Another prolific painter who showed similar discrepancies is Cézanne. Explanation of these discrepancies is difficult, but it is a possibility that they represent the unmasking of a dyspraxic tendency under stress. I will return to those issues in future articles. Posted in General, Painting and tagged Beaumont, Cézanne, Claude, dyspraxia, optics, painting, reflections, Sisley, Turner, van Eyck, Waterloo. Bookmark the permalink.